The cannabis craze has arrived. And it has created a surge in pot stock prices everywhere. The most jaw-dropping example? Canadian cannabis producer Tilray (NASDAQ:TLRY). Two months ago, Tilray stock went public at $17 per share. Recently, the stock crossed above $200 and $300 in the same day, marking a greater than 17-fold increase in eight weeks. In that same day, Tilray stock dropped to $150, before rebounding and closing above $200. Today, the stock trades at $170. That is pure speculation. Any smart investor would avoid Tilray. But, that doesn’t mean every pot stock should be avoided. Instead, I think there is one pot stock out there that is worth buying and holding amid the cannabis craze. That stock is Canopy Growth (NYSE:CGC). CGC stock is different than its peers. The company has a massive investment from a major alcoholic beverage company. Canopy also spends a fair amount on R&D, and has a venture arm that is further diversifying investor exposure to the cannabis market. Plus, the company is the unrivaled sales leader in the space. The volatility in the stock has been muted relative to other pot stocks. And, despite the cannabis craze inflating pot stock valuations to absurd levels, CGC stock’s valuation remains reasonable. All together, Canopy Growth stock is a marijuana stock. But it doesn’t look like other pot stocks. It is relatively low-vol, has much less speculation and the valuation is supported by fundamentals. As such, I think CGC stock is the name to own in the cannabis space. The cannabis craze has hit markets with an unprecedented fervor for one major reason. The writing is on the wall, and that writing says in all caps that the cannabis market will be huge. When fully legalized, the marijuana market could be as big, if not bigger, than the alcoholic beverage market. Global regulation of marijuana is currently one giant mess. 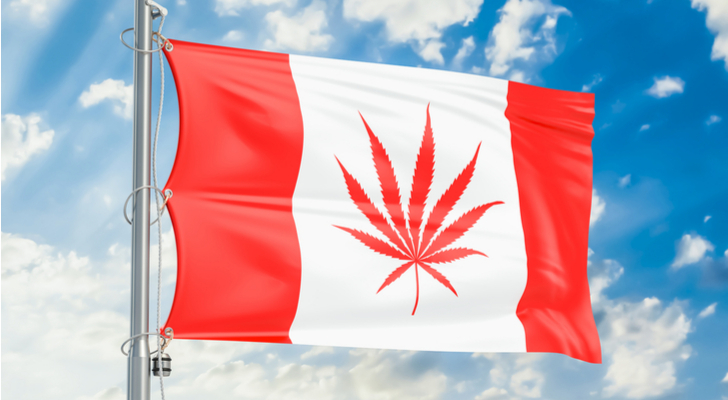 Two countries have fully legalized recreational use and possession of marijuana (Canada and Uruguay). But, in the bigger of those markets (Canada), the roll-out of brick-and-mortar marijuana locations is being delayed. Meanwhile, in the United States, nine states have legalized recreational marijuana, while twenty-plus others have legalized medical marijuana. But, in one of the biggest domestic markets (California), marijuana is largely failing to meet state safety standards. Overall, cannabis legalization is tough to follow and highly fragmented. But, there really is only one important trend to note here. In 2001, two countries were exploring cannabis legalization. In 2014, that number grew to five. Now, the number stands at over 25. In other words, whereas it took 13 years to add three countries to the marijuana legalization docket, that docket is now adding more than five countries per year. Regardless of your personal belief on the matter, there is no denying the current trend of accelerating cannabis legalization. If this trend persists and even continues to accelerate, then we are looking at largely global cannabis legalization in the not-too-distant future. If cannabis becomes as globally legal as alcoholic beverages, then usage data points suggest that the cannabis market could be as big, if not bigger, than the alcoholic beverage market. Roughly 33% of U.S. high school seniors drink on a monthly basis. That rate is down big from 50%-plus in the early 1990’s. Meanwhile, roughly 23% of high school seniors use marijuana on a monthly basis. That rate is up big from under 15% in the early 1990’s. If current trends persist, then marijuana and alcohol consumption rates among high school seniors should be roughly equivalent in five-plus years. The U.S. alcohol market measured $120 billion in revenues in 2016. The U.S. cannabis market measured under $10 billion in revenues last year. Given current consumption trends, I reasonably see the U.S. cannabis market going from under $10 billion to over $120 billion over the next decade. The cannabis craze of today feels a lot like the Dot Com Bubble. You have a nascent industry that has tons of potential, and a few companies claiming to have first mover’s advantage. The valuations of those companies subsequently explode higher as investors treat them as if they are going to be the only players in this potentially enormous industry. The Dot Com Bubble ended with a bunch of companies going bust, and a few surviving and eventually becoming massive (think Amazon (NASDAQ:AMZN) and Alphabet (NASDAQ:GOOG, NASDAQ:GOOGL)). We will likely have the same thing this time around. Most marijuana stocks are undifferentiated. You can’t tell them apart. Therefore, you can’t really say with any confidence who the winners will be. That isn’t true for CGC stock. Canopy is the leading player in this market by a long shot. The company also has a $4 billion investment from Constellation Brands (NYSE:STZ), an investment which allows Canopy to grow under the huge Constellation umbrella and gives the company tremendous capital to invest and expand. Moreover, Canopy spends a bunch on R&D, which will help the company eventually develop a tech-rooted moat, and CGC has a venture arm which further diversifies this company’s exposure in the cannabis industry. Overall, Canopy is simply heads and heels above the competition. That is why CGC stock has traded higher during this cannabis craze, but also avoided the huge gyrations many of its peers have been victim to. The stock price reflects strengthening fundamentals, not reckless speculation. I’m bullish on the cannabis market, but bearish on most pot stocks at this point in time. To me, they are pretty much all the same, and I have very little confidence in projecting any of them as a long-term winner. Except for Canopy Growth stock. This is the one name in the space that is different, mostly because of the $4 billion investment from Constellation and the company’s leading revenue position. Because of these differentiating factors, I think CGC stock is the name to own in the pot world. As of this writing, Luke Lango was long CGC, AMZN and GOOG. Article printed from InvestorPlace Media, https://investorplace.com/2018/09/this-is-why-canopy-growth-stock-is-the-best-marijuana-play/.